Indiana USSSA Baseball will have over 115 events throughout the State of Indiana to offer in 2019 that includes Open tournaments, AAA & Below, AA Only, and A level Tournaments. We are expecting over 300 teams in our Classed State Tournament. Indiana USSSA will offer 2 HUGE post season events in July that will include the GLOBAL World Series (OPEN) and AA World Series at Grand Park on July 10-14th. Play a true circuit of events that mean something and have a team goal of the ultimate prize being crowned World Series Champions. Indiana USSSA offers you the entire circuit. We look forward to hosting your team 2019. COACHES PLEASE READ THIS IMPORTANT INFOMATION BELOW. Teams 7-14u Must play in Three (3) Indiana USSSA events to be eligible for the State tournament. If a team has not participated in (3) Indiana USSSA events they still may play in the State tournament but will not be placed any lower than the AAA division. The State office will determine where you are placed. The (3) events must be prior to the weekend of June 9th weekend. This allows sufficient game data for the state office to have teams in their correct plaing classification by the State Tournament and World Series events. The USSSA State tournament will be seeded off USSSA points accumulated after the weekend of June 8-10th. Indiana teams must play in a Global WS Qualifier, State tournament, or the Global State tournament “Hit for the Cycle” to be eligible for any Global WS event. 15u teams do not have to play in any qualifiers to be eligible for the 15u State Tournament. 9u AA only tournaments and the 9u AA Indiana State Tournament are NO Leadoffs and NO Drop 3rd strikes. 9u AA World Series events will play normal USSSA Rules and allow lead offs and drop 3rd strikes as it’s a National level event. Indiana USSSA will have 2 Double Point Weekends. This event could combine divisions to insure we have enough teams to provide a quality tournament. It's early in the season and competing with Spring Break times. Join us at Deconess Sports Park, the top facility in Southern Indiana. This 15 million dollar facilitiy is absolutley gorgeous. Get your season started on the all 26 TURF fields at GRAND PARK. 150 points are on the line as Indiana USSSA Kicks off their first NIT event of the 2019 season. 4th Annual Around the Horn Classic. This event Sold out in 2018 with 70 AA teams. This is the best A & AA event to kick off the 2018 season. Don't miss out. Indiana USSSA Invades Field of dreams for the 4th annual Spring Training Classic. Field of dreams is an ALL TURF facility. This is one of 2 stops for Indiana USSSA Baseball at one of the top facilities in Indiana. AAA/Major Divsions could be combined if needed. HUGE Partnership for 2019 as Indiana USSSA Baseball and the World Baseball Academy join forces. Brand new TURF diamonds in the heart of Fort. Wayne. Can't miss this opportunity to play here with USSSA at the AWESOME Facility. TOP FACILITY IN NORTHERN INDIANA!!! Plus a $200 Prepaid Gate fee. This is a top 5 event in the entire midwest attracting teams from over 5 different states. We are offering All Classifications for All Divisions. This is going to Sell out quickly in 2019. This is the largest A / AA event in the entire midwest attracting teams from Indiana, Ohio, Kentucky and Illinois. This event has Sold Out the last 3 years and is a Must Play event for A / AA teams. The only 150 point event of the weekend accross the state. This event will attract top point getting teams from 2018. Don't wait to regsiter. Only taking max of 8 teams per age/classification. Indiana USSSA Baseball's premier 1 day Easter Weekend event returns in 2019 for the 3rd year in a row. This event has Sold Out the last 4 year. Offering both Open and AA divisions. ​Indiana USSSA invades Grand Park. This event will Sell out quickly. We had 175 teams in 2018 with a 30 team wait list to get in. Indiana USSSA makes 5 stops at Grand park in 2018. This event will qualify your team to participate in the Ulitmate Post Season event. The USSSA Global World Series held at Grand Park on July 10-14. ​Indiana USSSA makes a stop at the beautiful Crown Point Sports Plex. This event attracts teams from Illinois, Michingan, Wisconsin,Ohio and Indiana. Line drives of spring AA only event sold out in 2017 with 45 teams in 2018. Championship Belts are on the line at this brand new top of the line facility. This is a must attend event for Southern IN, and Kentucky teams. Don't miss out on this one. This split class event is always a huge event. Over 160 teams registered in 2018, this is one of the largest split class events in the State. Offering both AA and Major Classes. Get in early as this event was Sold Out in February last year. New partnership with Hit the Field Sports and Kendallville Sports Complex. AWESOME facility and great news for Northern Indiana teams. 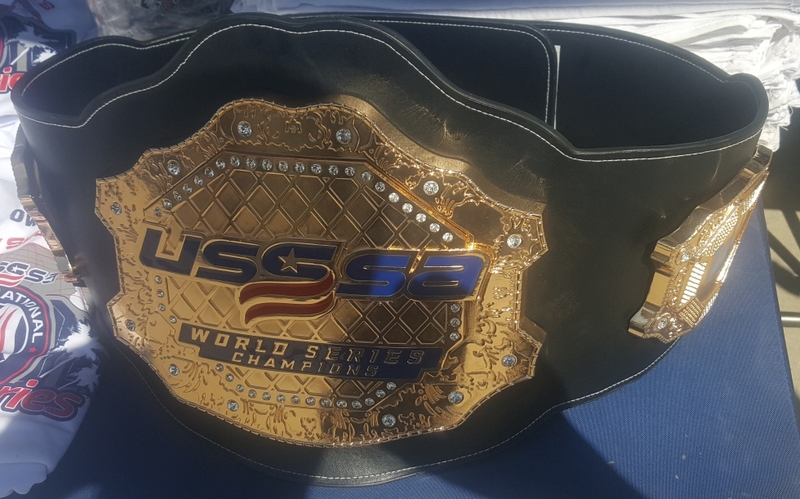 Belts will be given to 1st place teams in 9-14u age Groups. This is going to be HUGE. This event attracts the top teams from all over the country. It sells out every year and in 2018 had teams from 8 different states competing for the ultimate prize of winning a Berth to the Elite 32 World Series at the new all TURF USSSA Space Coast Complex in Vierra Florida. 90 of the Top Teams in the Midwest compted last year. This tournament will be talked about the "Who's Who in Travel Baseball" Come play the top talent around. Sold out 3 years in a row. Don't wait to register for this awesome event. 96 Teams competed in the 2018 edition of the select showcase. This is an event geared specifically for the A and AA Class teams. Another must play event that should be on any A / AA teams event schedule. Indiana USSSA Baseball has upped the Ante again and placed the AA only & AAA only SUPER NIT (600 Point) event at GRAND PARK. The nations largest sports Facility. The event sold out in 2018 by the end of March. AA/AAA Teams have the opportunity to play in BACK 2 BACK 600 point events if they play in the Open SUPER NIT on May 4-6. 4th Annual Mooresville Championships. This event sells out every year. 12th Annual RBI Showdown. This event sells out every year and attracts teams from mulitple states. This is Double Point weekend. Don't miss out on this tournament and the long history of this AWESOME event. Come visit one of the most beautiful facilities in Northern Indiana. Byers Sports Complex in South Bend. Teams can go visit Notre Dame Campus and get an experience of a lifetime. Indiana USSSA Baseball makes 2 stops here, don't miss out. Start getting qualified for the USSSA State Tournament on June 21-23 that featured 300 teams. Ohio Valley Sports will host this event at multiple facilities throughout Southern Indiana. 189 teams attended this event in 2018. All players on the Championship Teams IN BOTH OPEN AND AA DIVISIONS will receive Custom Championship Belts. There are only 3 events in the State of Indiana that will award the Belts in 2018. This is the largest event in Indiana outside of the State Tournament. Last year teams from 7 different States attended. Don't miss it. Indiana USSSA Will host this event at the beautiful ALL TURF facility "Field of Dreams" in Noblesville Indiana. This NIT event Sold in 2018 as this is last stop for Indiana USSSA baseball at the field of dreams for the 2019 season. 60 Teams in 2018. Come play on the TURF and Win the Marruci engraved BATS. All players on the 1st & 2nd Place teams will recevie a customized engraved Marucci Bat. This event is for (A) Level and Lower Level AA teams only. Rec all Star Teams welcomed as well. Sold out in 2018 with 50 teams. Indiana USSSA invades Grand Park. This event will sell out. We had 180 teams in 2018 with a 30 team wait list to get in. Indiana USSSA makes 5 stops at Grand park in 2019. This event will qualify your team to participate in the Ulitmate Post Season event. The USSSA Global World Series held at Grand Park on July 12-15. 11th Annual Hit for the cyle. This is the last weekend for teams to accumulate points for STATE TOUNAMENT Seeding. This tournament sells out every year and attracts teams from all over the Midwest. The only 400 point event of the year. Don't miss this annual event as it sells out every year. This is a AA & A Class Event. A Class Teams Play in their own division. Don't miss out on this tournament. Fathers day weekend sells out every year at Mooresville Sports Complex. This is for AAA and below teams. The Sandlot Showdown has Sold Out the last 2 years. This event is specifically for AA and A Class Teams. AA and A Teams will be split if possible into their own divisions. The Largest Baseball Tournament in Indiana with over 290 teams participating in 2018. This event will start early Friday Morning on June 21st. Coaches PLEASE read the qualification process at the top of the tournament page. The Largest Coach Pitch Tournament in the State of Indiana. All 1st and 2nd Place invidiual awards will be engraved Maricuui bats. Don't miss this event. Sells out every year. The Largest youth Wooden Bat tournament in the country. 85 Teams in 2018. Don't miss out. 3 FREE Wood Bats from Marucci to use for the tournament just for registering. This event is held at GRAND PARK, over 80 teams from 8 different states in 2018. The Ultimate way to end the 2019 season. Teams Must play in their respective USSSA State Tournament to be eligible. This event is held at Grand Park the top facility in the country. This event is open to all teams. It is a 6 Game Guarantee. 90 Teams from 9 States competed in 2018. 3. Global State Tournament "Hit for the Cycle" to play in the GLOBAL World Series. Indiana USSSA All-State Games hosted over 550 players in the inagural year in 2018. This event brings the top players in Indiana together for a weekend of fun and exciting baseball. With over 100 tournaments state wide Indiana USSSA Baseball has access to the top talent in Indiana. We will be inviting top players from each weekends touranemnts to attend this special show-case event. Players are nominated by their team finishing 1st or 2nd in a tournament. Each player receives and ALL-STATE Ring and Certificate. Player Must be present on Opening Ceremonies to receive their Ring and Certificate.